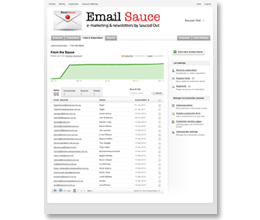 Creating and managing subscriber lists is quick and simple with Email Sauce. We look after all the boring bits like handling bounces and unsubscribes so that know that your list is up-to-date and you don't waste money sending to old addresses. You won't annoy people either, as we will never send to anyone who opts out of receiving your mail. Simple list management - no more messy contact lists! Our intuitive interface lets you get things done fast. Adding, removing and editing subscribers are all simple steps. See at a glance how well your subscriptions are doing. Stay on the right side of spam laws! You’ll be sure to keep your mailing list on the right side of the spam laws. Every email you send will include an unsubscribe link (required by spam laws) and a user preference center allows subscribers manage their own subscription. Have different groups you want to send to? 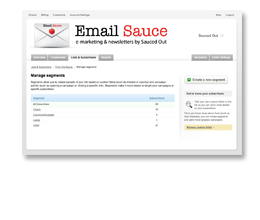 Email Sauce makes it very easy to target specific subscribers with your campaigns. You have the flexibility to create as many different lists as you need at no additional cost. You can even customise the entire signup and unsubscribe process for each list, allowing you to set unique landing pages and welcome emails as users join. Add a subscribe form to your own website. 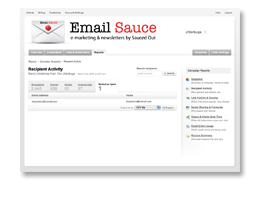 With Email Sauce, this is as simple as copying and pasting some code. 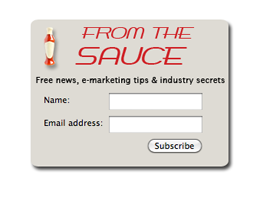 You can also customise any landing pages so the entire subscribe process stays on your own site. Don't have a website? Then contact us about setting you up with a sign-up page for as little as $99. Use our simple form builder to create signup forms you can easily add to your site - or ask us to do it for you. Send targeted campaigns to groups of subscribers based on your own criteria. Change the look and feel of the entire signup and unsubscribe process. Never send to anyone who has unsubscribed, bounced or marked you as spam. Require subscribers to confirm their email address when signing up to your list (optional). Track new subscriber activity for any of your lists without needing to login. Let your recipients manage their own subscription preferences. No matter format your lists are in, we make it easy to import into your account. Sign up now for your free account.